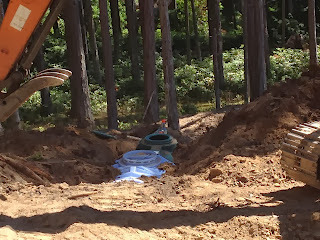 One of the really big jobs to get done prior to building the house is the septic field. I would really have preferred not to have had to put one in. I believe that on an island that sets a priority of conserving water that it is time to seriously consider alternatives to demanding the use of septic fields as the only means of sewage treatment. It seems a shame to use so much water in order to flush the sewage into a septic tank and field. 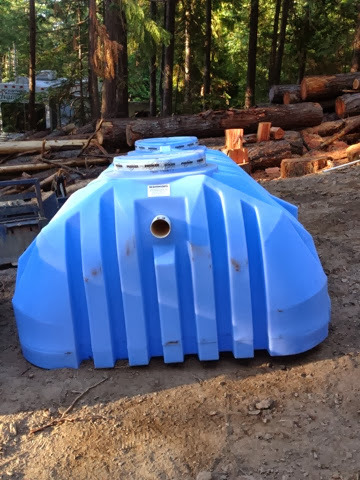 There is now well documented evidence of communities that use advanced composting toilet systems and these communities manage to protect their water shed as a result. 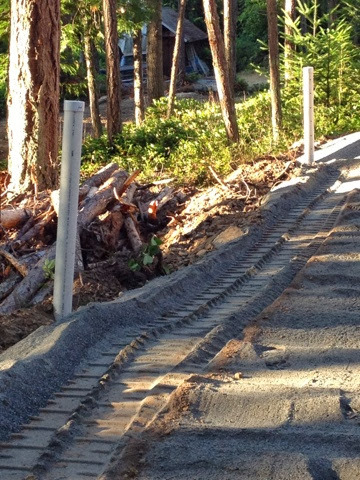 It would be nice to hope that in the future such alternatives will be available to home builders on Mayne Island. 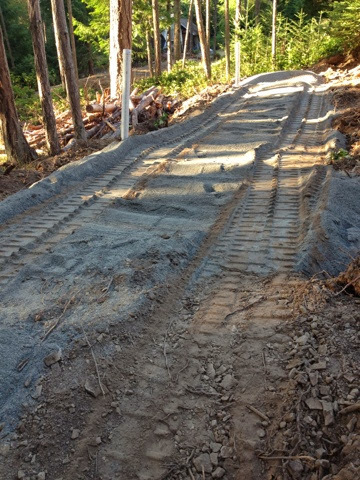 In order to put in a septic field on Mayne Island, you have to have a design engineered and approved by the Islands Trust/Health Authority. 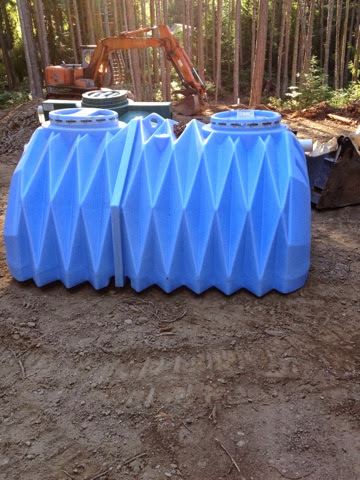 Andrew Money designed and got permission from the powers that be for my septic field and tanks to be installed. 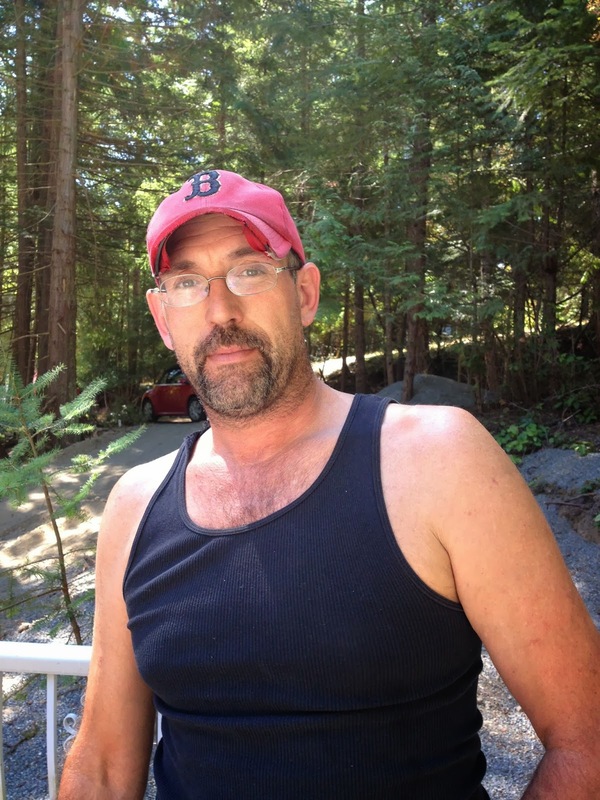 He lives on Saturna Island and works with Matt Taylor of Mayne Island. Matt has all the heavy equipment you see in these pictures. He was unable to put my septic in himself due to a broken wrist that needed time to heal properly. Luckily Andrew was available to do the work and I so appreciate the job he did for me. It is great when island folk pull together to help get the job done in this way. Andrew was excellent and I am so happy with the work done. Ready for the pipes to be laid. 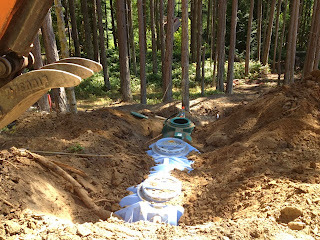 The actual septic field extends below the site where the house will sit. 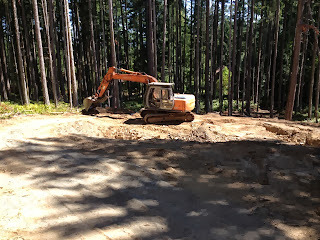 My lot is on a slope so we stepped down for the septic field. It is set on a terrace that will be accessible by stairs from the patio. Here you can see the drop off from the building site. Lots of care taken to smooth off the field. 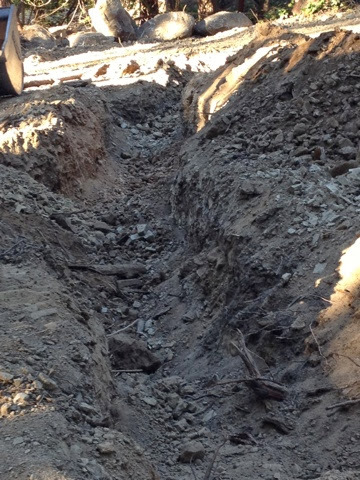 Lots of sand in the septic field with upright pipes. 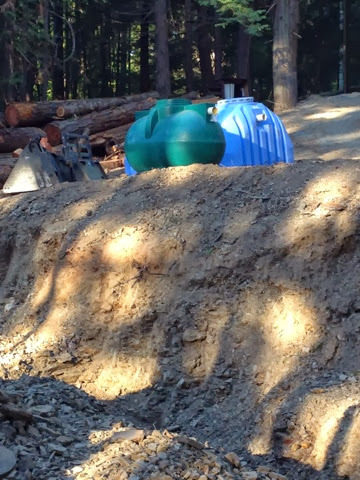 The tanks were first placed up on the top of the site while the excavation was completed. 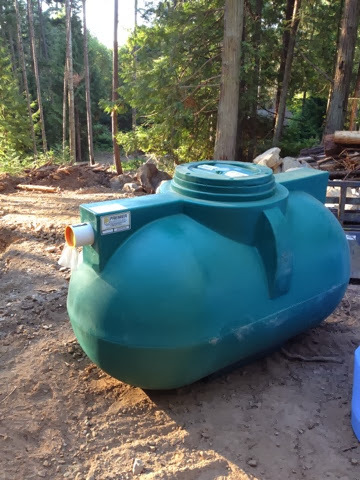 Tank waiting to be installed. There were two tanks with three chambers. 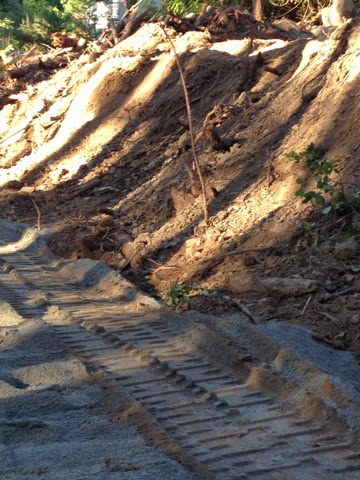 These had to be buried in the ground below where the house is being constructed. Front view of the tank. The side view of the double tank. In position and being filled in. Andrew was so skilled at filling in around the tanks with the back hoe. 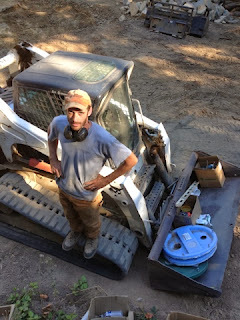 So now I have my tanks and septic field installed I can heave a huge sigh as it was one of the major steps towards beginning the actual building of the cob house. A very important part of the infra-structure.